Asset prices are off to the races, as the S&P 500 logged a 13% gain through March 31, the best quarterly showing since the summer of 2009. Credit has likewise marched higher, with the Bloomberg Barclays High Yield Index jumping 7.3%, the steepest quarterly rise since 2003, while the Markit iBoxx Leveraged Loan Total Return Index rose by 4.8% for its best quarter since 2010. The Fed’s dovish swivel figures prominently in the bull move in credit, as interest rate futures now expect rate cuts instead of further tightening and the “QT” asset run-off is set to end in six months. At the same time, loan defaults reached a seven-year low in March as the post-2009 economic expansion is now three months shy of a record length. A mismatch between new supply and demand also helps. Junk bond volumes tallied $59 billion in the first quarter, down 5.5% year-over-year and the slowest pace of issuance since 2016. On the loan side, new volume fell to $85.2 billion in the first quarter, down a hefty 68% year-over-year according to data compiled by Bloomberg. Last Thursday a report from Moody’s Investor Services noted “unprecedented flexibility” on the part of borrowers to make investments free of obligations to maintain certain leverage levels, as well as an “aggressive use of investment capacity” that allows issuers to shift assets beyond creditors’ reach, leaving investors “in uncharted territory.” Indeed, Moody’s determines that 2018 saw the weakest credit agreement protections on record, a fact that bodes ill for recoveries when the cycle turns. On that score, a prominent cautionary tale finds itself back in the news. On Thursday, the J. 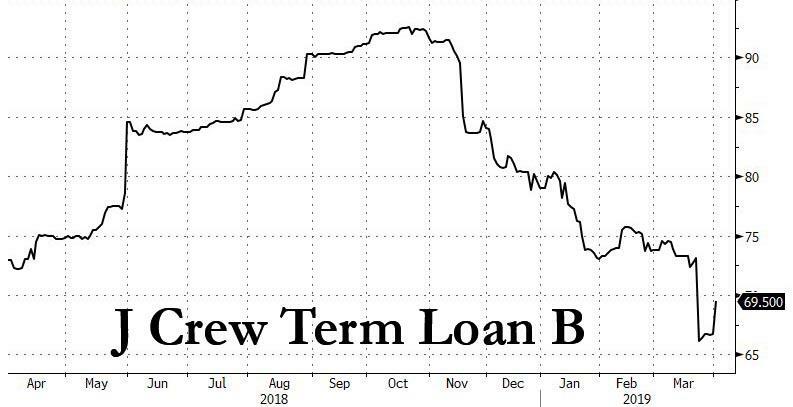 Crew Group, Inc. term-loan B fell to 66 from 92 as recently as Oct. 22, 2018, after the fashion retailer reported a full-year adjusted EBITDA decline of more than 50% with cash on hand dropping to $25.7 million at the beginning of February from $107 million a year earlier. The company, taken private in 2011 by Leonard Green & Partners, L.P. and TPG Capital, earned the ire of creditors in 2017 by transferring $250 million worth of intellectual property to a foreign subsidiary (out of the grasp of supposedly-senior bondholders) and then issuing $250 million in fresh debt backed by the same IP. A slightly different saga featuring private-equity owned PetSmart, Inc. continues to unfold. In April 2017, PetSmart bought online pet supply company Chewy, Inc. for $3.35 billion. Just over a year later, PetSmart transferred a chunk of Chewy’s equity to an unrestricted subsidiary, out of the reach of the company’s creditors. Those jilted bondholders sought legal recourse against PetSmart for alleged “fraudulent” behavior, claiming that PetSmart was already out of compliance with a fixed-charge coverage ratio test. On Thursday, a federal judge ordered the company to turn over documents related to the transfer of Chewy equity. A day later, Bloomberg reported that PetSmart creditors rejected the company’s offer to add new investor protections in return for dropping their litigation. PetSmart’s term loan reached a post-2017 high of 89 cents on the dollar Friday, potentially indicating that the lawsuit is gaining traction.